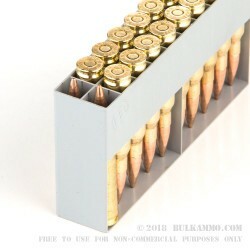 500 rounds of some of the finest .308 ammunition you can find at the price point, this is a case lot of Sellier & Bellot 180 grain cartridges that feature a heavy full metal jacket projectile on top of a brass case cartridge with a Boxer primer. The classic loading combined with S&B’s excellent quality and tight quality control means this is a very generous loadout, which features a reloadable brass casing with a Boxer primer. This value add is the type of thing that S&B is famous for. 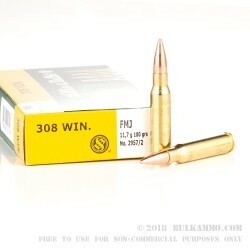 Most of what they make is a modern version of classic military rounds, with an improved overall quality and a very reliable set of components. Accuracy is excellent; on par with the best US Military surplus and top quality domestic manufactured military style loads. 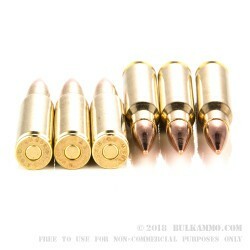 The heavy projectile gives many options for those who may want to repurpose it for hunting or other needs. This is not your standard plinking and paper target round, even though it really looks like one aesthetically. The 2411 feet per second velocity and the 2331 ft. lbs. of energy give it a strong performance by the numbers; the quality components and production oversight makes it improved upon, in implementation.